Most of the Literacy Beat Team will be in New Orleans at the International Reading Association (IRA) this weekend. We have created a series of short posts with links to online resources about our activities there. Each day of the conference, you will find our content shared here for you. On Friday, Jill and DeVere will be at the Writing Moments Institute organized by Kathy Ganske. This session showed teachers ways to structure evidence-based discussions that draw upon both text and experience to aid students in developing academic language, writing proficiency, and content-area learning. Participants took part in informational text reading and evidence based discussions that serve as preparation for writing an argument. Ways to use digital tools to support writing and thinking were highlighted and demonstrated. Workshop materials, include the PPT and all activities can be accessed from the workshop’s Google Site. How many sources do we need? Teachers hear this question all the time, and it is really a tough one, not as easy as it sounds. Writing from and with sources means students must often consult a wide variety of sources, use some, discard others, and make sure the sources they do use are appropriate and relevant. The task is not as easy as it sounds; then add to that the complexity (cf. Spiro, et al., 2004) of the topics students encounter in middle and high school, and an arbitrary number of sources suddenly seems to impose limits on student exploration, not a door to further exploration (Wolsey, 2010; Wolsey, Lapp, & Fisher, 2012). In this session, participants learned how to construct a prompt or direction for writing (e.g., Hillocks, 1986) that engages student-scholars, teach students to use solid argumentation approaches (cf. Toulmin, 2003, Walton, Reed, & Macagno, 2008) in the disciplines, promote inquiry through composing processes in content areas, and use digital tools. The need for breadth and depth of vocabulary accelerates through the grades as students encounter more challenging academic texts in print and on the Internet (CCSS, 2010). Improving students’ vocabulary is critical if students are to develop advanced literacy levels required for success in school and beyond, in the world of higher education and the workplace (Biancarosa & Snow, 2006; Graves & Watts-Taffy, 2008; Lubliner & Grisham, 2012). Research suggests that students with a well-developed vocabulary learn many more words indirectly through reading than from instruction (Cunningham & Stanovich, 2001). If wide reading promotes vocabulary development, then conversations about their reading with adults and peers also strengthen students’ word learning (Biemiller & Boote, 2006). The goal of effective vocabulary instruction is to promote a lively interest in words through student expression and participation in a learning community that enjoys playing with words, builds on individual interests as well as curriculum needs, and emphasizes self-efficacy in word learning (Beck, McKeown, & Kucan, 2008; Graves & Watts-Taffy, 2008). As we have noted in this blog, the impact of technology on vocabulary development also needs to be considered (Castek, Dalton & Grisham, 2012). In other contexts, we have suggested that technology integration should be generative in the sense that learners should use technological tools to satisfy their curiosity and to generate creations for learning and for the demonstration of learning (Grisham & Smetana, 2011). Vocabulary instruction may occur before reading (preteaching important vocabulary), during reading (teaching what emerges as needed), and after reading. Vocabulary Self-collection Strategy or VSS (Haggard, 1982), is an after reading strategy. The Common Core (2010) requires that technology be integrated into instructional and independent learning sequences. Research has shown that the use of technology and technology-based instruction enhances student learning. In the post-reading vocabulary assignment we explore here, teachers may use use several forms of technology to increase student interest in vocabulary and a variant of the VSS strategy to engage students in more robust vocabulary learning. Vocabulary Self-collection Strategy Plus (VSS+) occurs after a selection has been read and is based on the principles of VSS (Haggard, 1982), a researched-based strategy that captures the essence of vocabulary learning: multiple exposures to a word, multiple readings of a text, collaboration of students and teacher, oral discussions and presentations, selecting words that are important to know, writing a script and recording a podcast, Internet search for illustrations, and building semantic webs. Recently, two colleagues (Thomas DeVere Wolsey and Linda Smetana) and I worked in a fourth-grade classroom in a public school in Northern California, to teach the students how to make an online dictionary (e-dictionary) page using the VSS+ strategy. The three of us spent three hours with Mr. D’s 33 students, first in the classroom, then in the computer lab at their school. VSS+ is a structure that becomes familiar to students so they can use it with more independence over time. It takes more time in the beginning as teachers and students get used to the technology, the time, and the process. To teach VSS+ we wanted to use text with interesting or unknown words or text dense with academic language. Mr. D provided us with a passage from the Science textbook in use in his classroom. Mr. D pre-taught some of the vocabulary and students had already read and discussed the package when we arrived. Collaboration and peer learning are essential to the VSS+ strategy. Mr. D had the students divided into cooperative groups of 4 students. In order to differentiate instruction to meet the learning needs of students, they may be grouped heterogeneously or homogeneously as needed. Mr. D’s students were grouped heterogeneously. To teach the VSS+ strategy, we began in the classroom with a PowerPoint slide and a demonstration of the strategy. Using a think aloud protocol, I modeled the strategy by presenting a nominated word to the class, and provided suggested answers to the following questions. 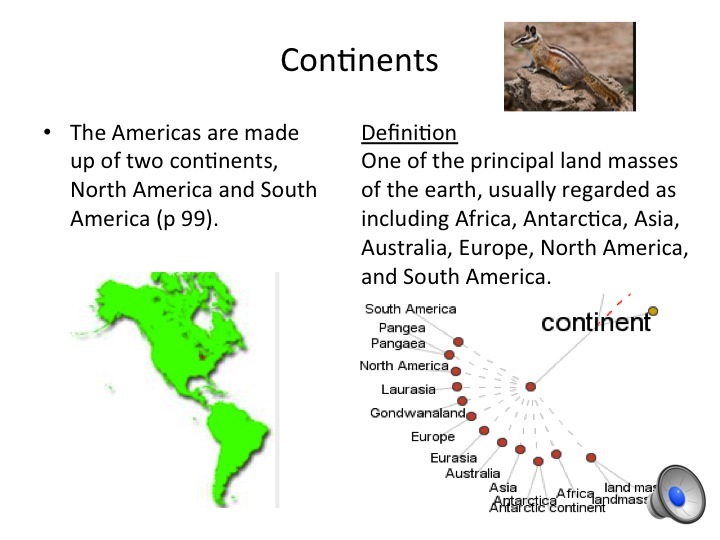 In the demonstration, we used an example that we constructed on “continent” (see below). These are the three elements that students must consider as they nominate a word. b. What do the team members think the word means? c. Why did the team think the class should learn the word? The team must tell the class why the word is important enough to single out for emphasis (a rationale). During the team presentations of nominated words, we facilitated discussion, listened to students’ projected meanings of the word, and invited class members to contribute additional clarifications of the words. A chosen target word was allocated to each team to prepare an e-dictionary page. Then came the fun part! We adjourned to the computer lab where we asked students in Mr. D’s class to use two formats for their e-dictionary pages: PowerPoint (like our example below) and a program called Thinglink. In the lab, under teacher supervision, team members used the Internet to locate images and or definitions for the target word and then collaboratively determined which of the images/definitions best fit their prediction of the word meaning. 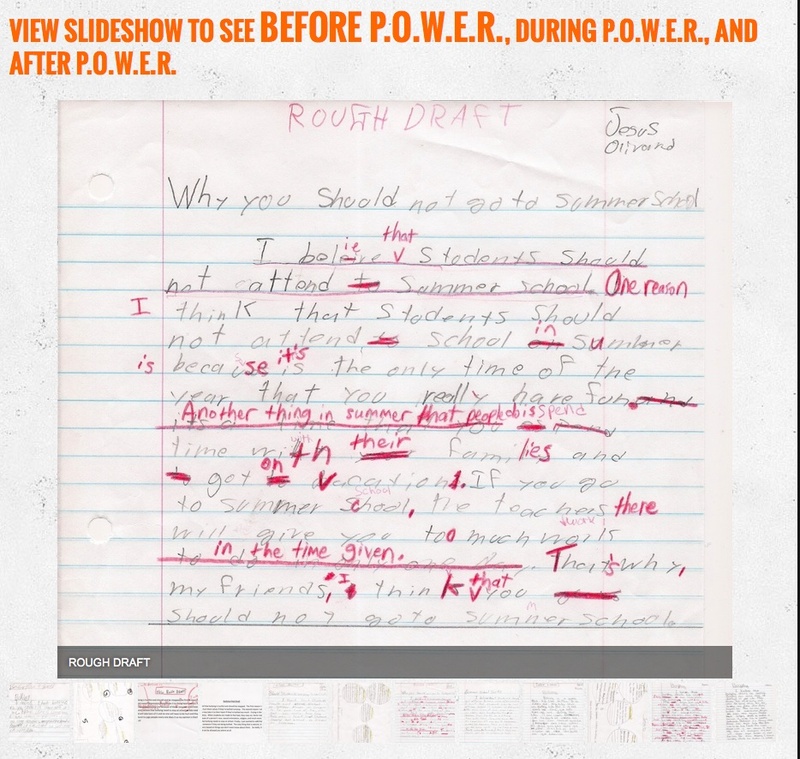 Next week in Literacy Beat, Linda, DeVere and I will talk more about the work we did with Mr. D’s students and share examples of their PowerPoint and Thinglink pages with you. Biancarosa, C., & Snow, C. E. (2006). Reading next—A vision for action and research in middle and high school literacy: A report to Carnegie Corporation of New York (2nd ed.). Washington, DC: Alliance for Excellent Education. Biemiller, A. & Boote, C. (2006). An effective method for building meaning vocabulary in primary grades. Journal of Educational Psychology, 98, 44-62. Blachowicz, C. L. Z., & Fisher, P. (2000). Vocabulary instruction. In R. Barr, P.
Mosenthal, P. S. Pearson, & M. Kamil (Eds. ), Handbook of Reading Research, vol. III, (pp. 503-523). White Plains: Longman. Castek, J., Dalton, B. & Grisham, D. L. (2012). Using Multimedia to Support Generative Vocabulary Learning. In J. F. Baumann & E. J. Kame’enui (Eds.). Vocabulary Instruction: Research to Practice (2nd Edition). New York: Guilford. Common Core State Standards Initiative. (2010). Common Core State Standards for English Language Arts & Literacy in History/Social Studies, Science, and Technical Subjects. Washington, DC: CCSSO & National Governors Association. Cunningham, A.E. & Stanovich, K. E. (2001). What reading does for the mind. American Educator, 22, 1/2, 8-15. Graves, M.E. & Watts-Taffy, S. (2008). For the love of words: Fostering word consciousness in young readers. Reading Teacher, 62, 99.185-193. Haggard, M. (1982) The vocabulary self collection strategy: An active approach to word learning. Journal of Reading, Vol. 26, No. 3 (Dec., 1982), pp. 203-207. Grisham, D.L. & Smetana, L. (2011) Generative technology for teacher educators. Journal of Reading Education, 36, 3, 12-18. Lubliner, S. & Grisham, D. L. (2012). Cognate Strategy Instruction: Providing Powerful Literacy Tools to Spanish-Speaking Students. In J. Fingon & S. Ulanov (Eds. ), Learning from Culturally and Linguistically Diverse Classrooms: Promoting Success for All Students (pp. 105-123). New York: Teachers College Press. 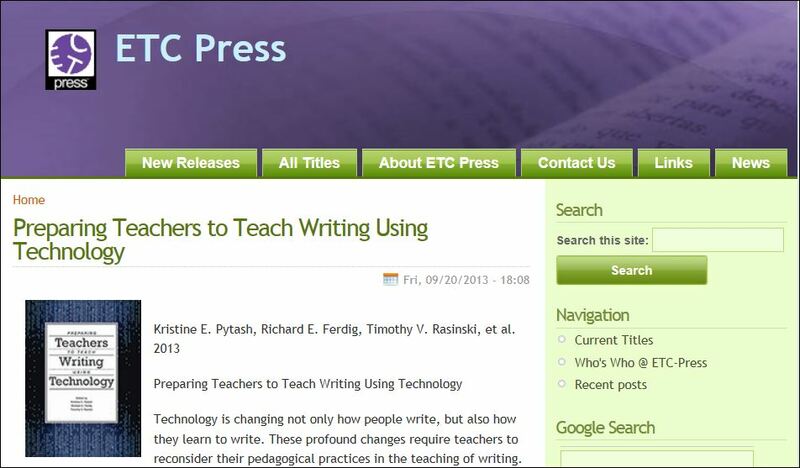 Thanks to ETC Press and editors Kristine Pytash, Richard Ferdig and Timothy Raskinski, we have a valuable new resource to guide our work integrating technology into writing instruction. I have copied below the description of the book, followed by the table of contents. I encourage you to download the book and then sample chapters of interest. Note that there is also a link to supplemental materials for Rish’s Chapter 1, Beach and O’Brian’s Chapter 5, Collet’s Chapter 8, and McIntyre’s Chapter 10. Technology is changing not only how people write, but also how they learn to write. These profound changes require teachers to reconsider their pedagogical practices in the teaching of writing. This books shares instructional approaches from experienced teacher educators in the areas of writing, teacher education, and technology. Chapters explore teachers personal experiences with writing and writing instruction, effective pedagogical practices in methods writing courses, and professional development opportunities that effectively integrate technology into the writing classroom and contribute to students’ growth as writers and users of technology. While the chapters in this collection are written to inform practice, they are written from a theoretical and empirical base by research-oriented educators in our field. Each chapter provides a research base for a particular instructional approach, a description of their strategy, and examples from instructional settings that highlight how the pedagogical practice advanced the knowledge of the teachers in the areas of writing instruction and technology. This collected volume provides as up-to-date understanding of how teachers are prepared to teach writing using technology. In addition to the free ETS Press volume on writing and technology, Ferdig and Pytash have also recently published an edited volume, Exploring Multimodal Composition and Digital Writing. Good writers often read their writing out loud as they are composing and revising. Sometimes the focus is on checking for meaning and the flow of the language. Other times the focus is on checking that the sentences are the right length and are appropriately punctuated. Of course, not everyone is comfortable doing this, and some may get so caught up in reading what they intended to say, that they aren’t able to listen critically and notice what’s not working. This blog post features 2 tools, a text-to-speech reader that is available in most word processors and VOKI, a free talking head avatar. Did you know that most computers and word processing programs now have a free text-to-speech tool that you can install on the toolbar? I use a PC, so I’ll focus on the Microsoft tool that will read aloud written text in Word, Outlook, PowerPoint and OneNote. You can choose your voice and the rate of speed. You simply highlight a word or section of text and click the speak tool on your toolbar to listen to your text being read aloud. Granted, TTS tools still have voices that are a bit robot-like. However, the focus here is not on expressive reading, but rather, listening to catch major editing issues. There are several ways to use TTS as a revision and editing support. Of course, depending on the length of the text, you can always listen to the text in its entirety to get an overall sense of how it’s working. Below are some targeted revision/editing strategies that can make the process more manageable for writers. Highlight a paragraph and then click on the Speak tool in your Word toolbar. Does this paragraph make sense? Does the lead sentence engage you and/or give you a sense of what the paragraph will be about? Highlight the opening sentence of each paragraph and listen to hear how the paragraphs are building on one another to create an overall text that meets your genre requirements and writing goals. Do the opening sentences give you a sense of how the text is building to tell a story or present an argument? Are there some paragraphs that seem to be standing on their own, and aren’t connected to the rest of the text? Are there big jumps between paragraphs where I need to make a transition? This is a quick and easy check. The TTS tool will read along at the same rate, pausing only for punctuation. Run on sentences and fragments without punctuation will sound very strange! Do I have any very long sentences that are hard to understand? Do I have some sentences that aren’t complete? Listening to check spelling will only capture misspellings that result in a phonetically different pronunciation. For example, typing ‘happee’ for ‘happy’ will sound okay. Typing ‘hape’ or ‘hapy’ for ‘happy’ will not! 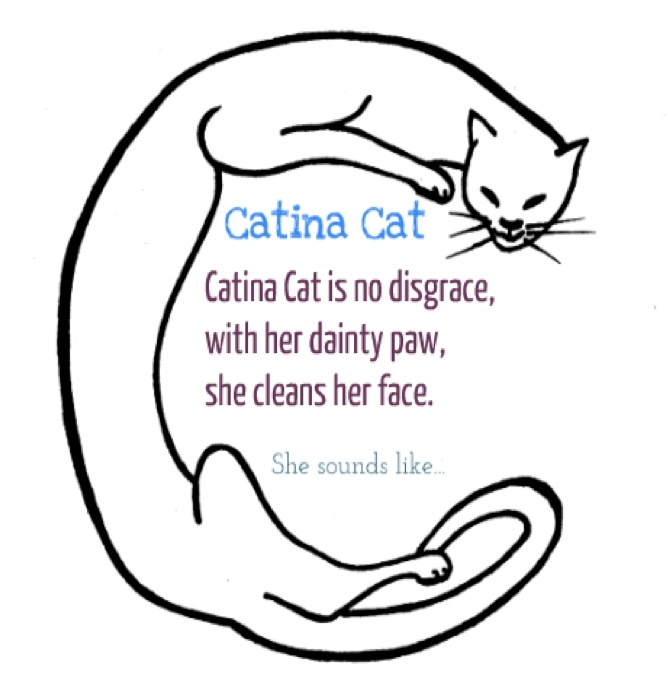 This process does help writers learn to listen for misspellings, which can be useful. However, you will want to connect this kind of spelling editing check with the use of the embedded spell checker tool or an online dictionary. Do my words sound right? 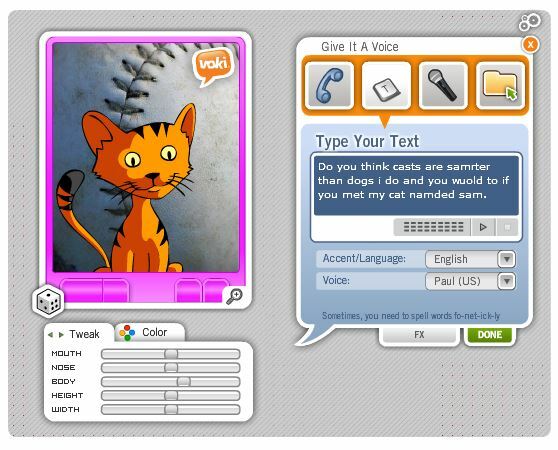 VOKI is a free online tool that even young children can use to create an avatar who will then read the text they have typed in aloud to them. Clearly, this can be engaging for students, since it allows them to create a reader and watch the reader speak their text. It only takes a few minutes to customize your avatar. Then, you choose the TTS read aloud option and enter your text. If the text has been created in a word doc, you can copy and paste it into the text input box. You may preview it, save it, and/or email it. All of your saved avatars will be available in your ‘my avatars’ space. A word of caution – there is a 60 second restriction on each Avatar speaking segment on the free VOKI and 90 seconds on the school paid version. You will be surprised at how much the avatar can read aloud in 60 seconds. However, if the text is longer than 60 seconds, have students entered in portions (perhaps at the paragraph level or beginning, middle, end, of the text, etc.). This screenshot shows that I’ve created my cat avatar and typed in my text so that the avatar will read my text aloud with a TTS voice. 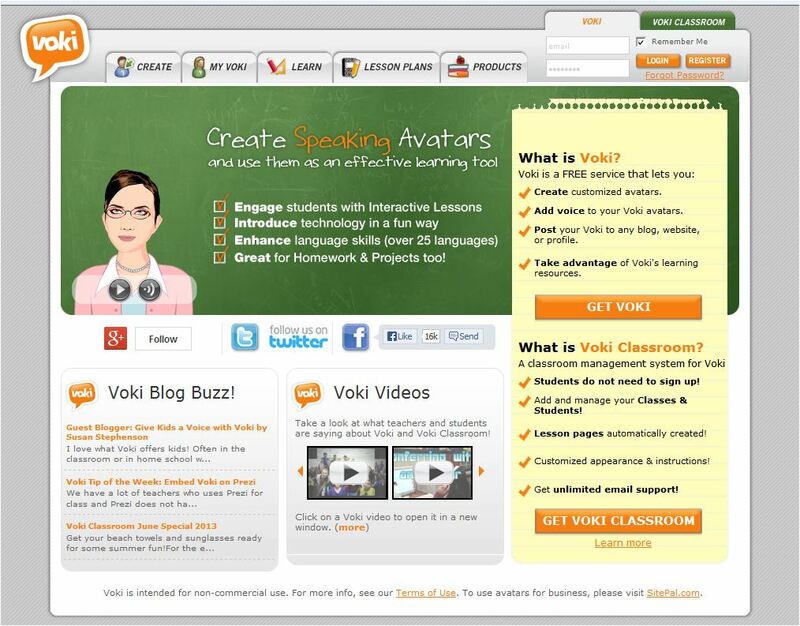 The VOKI website features videos created by teachers illustrating how they use VOKI in the classroom. Watch this video of Mr. Young’s classroom to learn from his students how they use VOKI to help them review their writing. One student realizes his text doesn’t make sense, another decided that he needs more sentences, a third notices that periods are missing, and a fourth hears mispronunciations that some spellings need correction. Please share your strategies for using TTS and Avatars to support your students’ literacy. In my last post, on March 2, 2013, I talked about a project that my colleague, Linda Smetana, and I did with teacher candidates who were asked to integrate technology into literacy lessons they were doing in their assignments in schools. Linda and I refer to this as “generative technology” and feel that when students create something as a result of using technology, there is a positive synergy about it. The teacher candidates benefit from learning to use technology in their teaching and their K-12 students benefit from creating something academic with the tools they are offered. Linda and I believe that “generative” technology needs to be infused into teacher preparation. Technology in teacher preparation tends to be “silo-ed” in the programs where we teach. By generative technology, we mean that the technology is embedded in the content of the course in teaching methods, rather than something “added on.” In my March 2013 post, I talked at length about the assignment that was generated and promised to share the products in my next post. So, here are a couple of the products that resulted from our generative technology assignment. Remember that there were 21 teacher candidates in the fifth quarter of a seven-quarter post-baccalaureate teacher preparation program; 17 of the candidates were simultaneously completing their masters degree in education while 18 of the 21 participants were earning their education specialist and multiple subject (elementary) credentials. First, teacher candidates showed a great deal of diversity in the choices they made about the technology they infused into their projects. The actual projects that candidates chose are listed below (all names are pseudonyms). Toontastic as a vehicle for Story Writing using the iPad. Strip Generator, student created panels regarding sharing. Luke’s presentation to the class was through Prezi. Using Xtranormal, a text to movie website; students created short films reflecting narrative story structure with their own scripts using text-to speech technology. I’d like to share just a couple of examples with you. 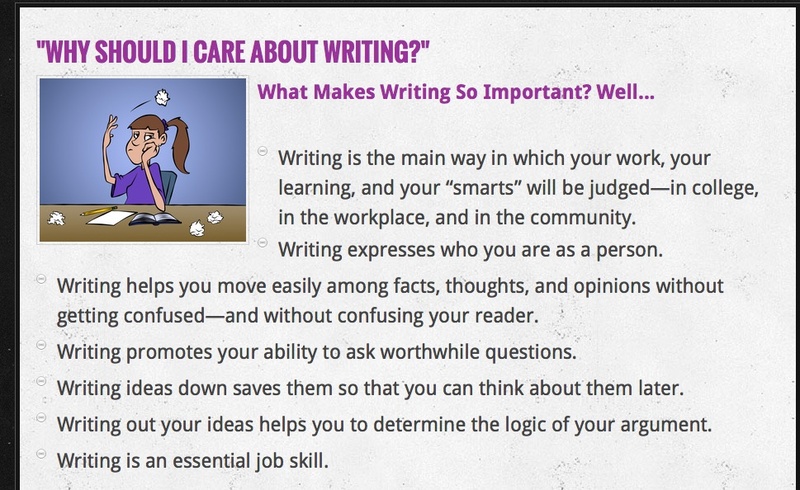 Another example is the Flamingo Writers Workshop, which comes from the middle school level. The teacher, Avram, developed the Flamingo Writers Workshop, a pullout group of behaviorally and academically challenged English Learners, all boys. The project lasted several weeks and Avram stated that they “stayed completely engaged” with it. The students created a website after receiving instruction in both writing and in using technology on Weebly (http://www.weebly.com/). Avram stated, “I wanted to give them something that they could remember for years to come.” One of the interesting aspects of this project was the parallel he drew and emphasized throughout the lessons, between writing as a process—as represented by the POWER acronym (Prewriting, Organizing, Writing, Editing, and Revising) and the “steps” for creating the website: Plan, Design, Create, Register, Inspect, and Publish. He stated, “Technology made everything we did more engaging to the students.” Avram, an admitted “technophobe” changed his views substantially, stating that the assignment “has certainly helped me understand that students need the enrichment and engagement that technology can provide.” He related that the website and the writing posted there gave these students an identity as a community that they have continued into other spaces. 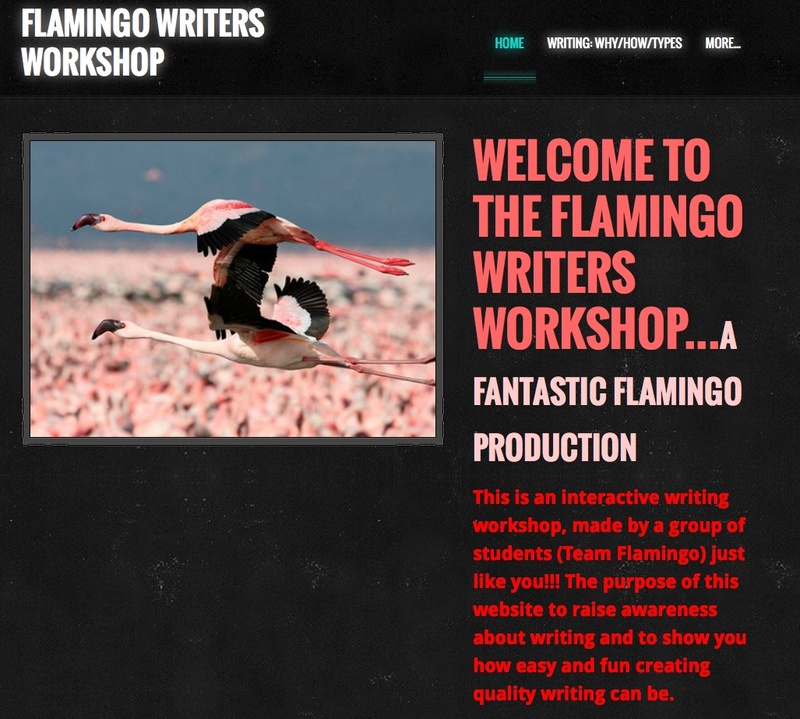 You can explore the Flamingo Writers Workshop (which continues to function as of this date) at http://flamingowritersworkshop.weebly.com/. The final example comes from the elementary level and was unique because it is the only project submitted that was not generative in the sense that students did not create anything, but from the report they were certainly the benificiaries. Linda and I believe that for all educators there is an urgent need to embrace technological tools for communication and composition in our homes and schools. There are examples everywhere of sound technology use in schools as well as the examples we have provided here (Google sites, for example). Teacher candidates need practical experience in using new tools in academic settings. Grisham and Wolsey (2012) have highlighted the fear factor that even technologically adept teacher candidates have until they gain experience applying new tools as teaching and learning opportunities for themselves and for their K-12 students. In teacher preparation programs, candidates can collaborate to support each other as they work with these 21st century tools. As teacher educators we are committed to articulate the use of 21st century technology for teaching and student learning across program courses so that teacher candidates may have multiple opportunities to practice and develop the skills to implement technology-rich instruction in their classrooms. We would like to stress that while ours is not the only way to meaningfully integrate technology into teacher preparation courses, we would argue that it is one effective way to do so and we invite readers to try this for themselves. In closing, I’d like to once again share the TPACK model that guided our students in their integration of technology and literacy. Another of our LiteracyBeat authors, Bridget Dalton, has shared this with teachers everywhere in her 2013 column in The Reading Teacher. Grisham, D. L. & Smetana, L. (in press). Multimodal Composition for teacher candidates: Models for K-12 classroom writing instruction. In R. Ferdig & K. Pytash (Eds. ), Exploring multimodal composition and digital writing. Hershey, PA: I-G-I Global. Mishra, P., & Koehler, M. J. (2006). Technological Pedagogical Content Knowledge: A new framework for teacher knowledge . Teachers College Record 108 (6), 1017-1054. Wolsey, T.D. & Grisham, D. L. (2012). Transforming Writing Instruction in the Digital Age: Techniques for Grades 5-12. New York: Guilford. My friend and colleague, Linda Smetana, and I have been working together since about 2004. She’s a full professor at CSU East Bay (Hayward, CA), from which I retired in 2010. Linda is one of those extraordinary scholars and teacher educators who stays close to her field—she teaches one day per week in a Resource classroom in the West Contra Costa Unified School District—and also works full time at the university, where she specializes in literacy teacher education in both special and general education. Recently, Linda and I have been investigating the intersections of literacy and technology in teacher preparation together and I’d like to share with you a project we just completed and the results of which are going to be published in a book edited by Rich Ferdig and Kristine Pytash, due out later in 2013. The TPACK model asks the teacher to look at the content of the lesson, or what we want students to learn, as well as the pedagogy (how best to teach this content), and then at the technological knowledge that might be advanced in the lesson. Where the three elements intersect is known as TPACK or the theoretical foundation and link between technology and praxis. In our courses, we have presented TPACK as the goal for integrating meaningful technology into lesson planning and teaching. The participants in our recent study consisted of 21 teacher candidates in the fifth quarter of a seven-quarter post-baccalaureate teacher preparation program; 17 of these candidates were simultaneously completing their masters degree in education while 18 of the 21 participants were earning their education specialist and multiple subject (elementary) credentials. In creating the assignment, we carefully considered the context for teaching of the candidates in the course, structuring the assignment so that all candidates could successfully complete it. Candidates had different levels of access to student populations. Accessibility ranged from 30 minutes a day three days a week, to the full instructional day five days a week. Teacher candidates also taught different subjects among them: English, History, Writing, Reading, Language Arts, Study Skills, and Social Skills. To insure that teacher candidates considered all aspects of their assignment in their write-ups of the project, Linda provided guidelines for the reflection. Students were responsible for learning to use the tools they chose. Linda collected and we jointly analyzed the data. Findings from the research were uniformly positive. In fact, right now Linda is doing post-research interviews with a couple of the candidates who have really taken to the integration of technology into their teaching. For the purposes of this post, I would like to share the assignment with you. In my next post I plan to share a couple of the projects. Teacher candidates were provided with guidelines for the technology assignment and provided with a list of potential tools that they might use for the assignment. They learned the TPACK model for planning. Below is the technology assignment from Linda’s syllabus and the list of technology tools (free or very inexpensive) provided for students to investigate. We offer this with complete permission for other teacher educators to use or modify for use in their courses. The Common Core Standards mandate the use of technology for instruction, student work, and student response. Students with special needs, especially those with mild moderate disabilities may not have access to technology or their access may be limited to hardware and software that may not be useful to support the learning process. During the second month of the class, we will have three independent learning sessions. These sessions are intended to enable you to complete the technology assignment. This assignment focuses on integrating technology with academic skill development, core content with teacher and student creativity. The focus should be on an aspect of literacy or multiple literacies. In this assignment you will use technology to develop a set of learning sequences for use with your students. You may complete this assignment in groups of no more than two individuals one of the technology tools in the syllabus or one that you locate on your own. If completed in pairs, the finished product must demonstrate increased complexity and include the work of students in both individuals’ classrooms. Your technology assignment should enhance the learning of your students. Prepare an introduction to the presentation to educate your viewer. Think about the content of the presentation, reason for the your selection this medium and/or process. Share how your presentation meets the needs of your students and reflects their knowledge. The assignment must incorporate student work. Identify how the students participated in the development and creation of the assignment. Prepare a thoughtful reflection of your thoughts on the process and the final product including the preparation, implementation and evaluation of the product and the management of students and content. This reflection should be descriptive and include specific examples. It may be submitted as a word document. Place your project on a flash drive that may be placed into the classroom computer for projection. Use your student work of materials from the web, interviews, u-tube and anything else that will capture students’ attention. In addition to the assignment, teacher candidates were provided with guidelines for reflection, seen below. What and how did students learn? Include both intentional and unintentional lessons. What would you do differently if you were to do this project again? What were the greatest successes of this project? How would you improve this project? What advice would you give a teacher contemplating a similar project? What kinds of questions did students ask? Where were students most often confused? How did you address the needs of different learners in this project? What resources were most helpful as you planned and implemented this project? To scaffold teacher candidates application of technology to lesson planning for the project, each one provided Linda with a proposal to which she gave feedback. Each proposal contained the following components: Context, Students, Standards (literacy and NETS•S standards), Technology, Process, and Product. Every student completed the assignment successfully and their reflections are highly interesting….more to come! In my next post, I will share with you some of the amazing projects that Linda’s teacher candidates produced. Grisham, D. L. & Smetana, L. (in press). Multimodal composition for teacher candidates: Models for K-12 writing instruction. In R. Ferdig & K. Pytash (Eds.). Exploring Multimodal Composition and Digital Writing. Hershey, PA: I-G-I Global. Mishra, P. & Koehler, M. J. (2006). 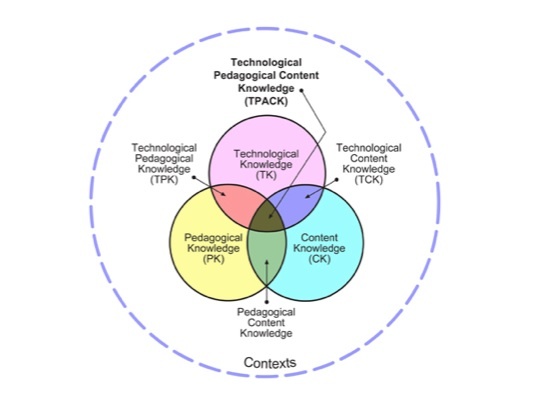 Technologiical Pedagogical Centent Knowledge: A new framework for teacher knowledge. Teachers College Record, 108, 6, 1017-1054.